Earlier today the team at Greater Auckland (formally Transport Blog) released their Congestion Free Network 2.0, a major evolution change to their Congestion Free Network 1.0 released back in 2013. Since 2013 parts of the Congestion Free Network 1.0 were adopted by both Auckland Council and Central Government. CFN 1.0 has been the platform to advocate and progress a more people orientated transport system rather than the car-centric system Auckland has had since the mid 1950’s. Of course we still have a very roads-first Central Government as the East West Connections saga would attest to but to be fair they are slowly (rather glacially) moving towards more progressive transport such as confirming their share of the City Rail Link, and the first version of the Urban Cycleway Network. Since CFN 1.0 the Unitary Plan has gone live (as of November 2016) and the Auckland Transport Alignment Project (ATAP) sits in the mix. 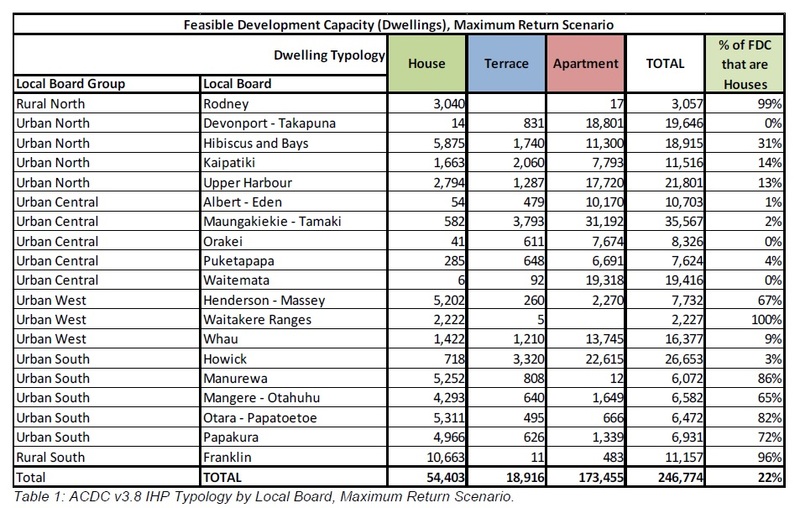 To add a spanner to the mix the Auckland Plan is under refresh right now and I am willing to wager that Auckland Plan 1.5 will be rather different to Auckland Plan 1.0. All this has meant time was due on a Congestion Free Network 2.0.
famous 1960s De Leuw Cather report which proposed many of the motorways we later built, however, while many of the roading projects were completed, the complimentary rapid transit network was not. 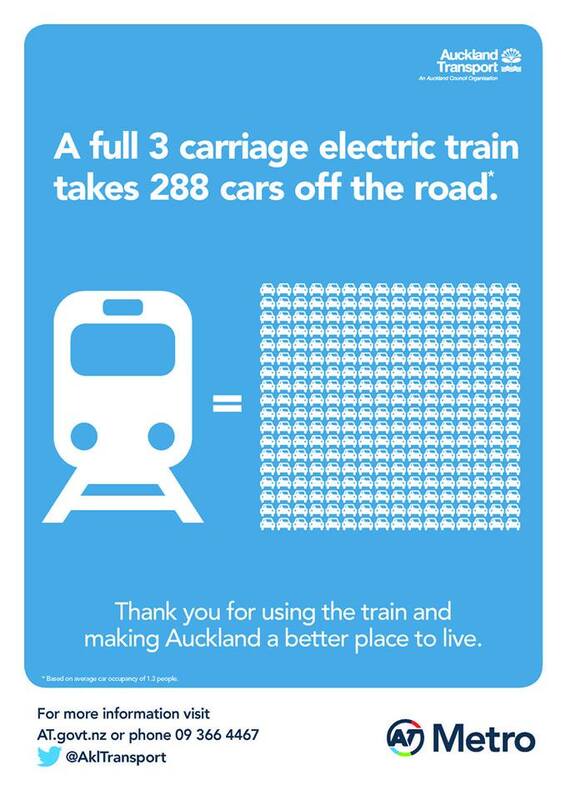 Yet we need to find a way of transporting more people as Auckland grows, a major challenge that has eluded us for decades. Connecting Aucklanders to major employment and social centre’s, including the city centre, growing metropolitan centres, and the Airport. Prioritising accessibility in areas that are seeing major (population) growth, including both greenfield areas and existing urban areas. To provide for the movement of people while balancing place making, the environment, safety, & health. Ensure value for money by optimising investments to the local context; this may be mean a rail line in one place and a painted bus lane in another. Ensuring equitable transport options throughout the city, especially to low-income areas where people have historically lacked transportation choices. To provide a quality transport network for all transportation needs & users, thinking beyond just the traditional commute, an 8-80 network. To provide congestion free alternatives, using of spatially efficient transportation modes to maximise people travelling free of congestion, as well as the capacity of the network. Each sub-region is unique in its residential, employment, economic output and transport patterns all requiring a heterogeneous (rather than homogeneous) approach. The Congestion Free Network 2.0 strengthens the transit links between the three sub-regions while also strengthening transit within the respective sub-regions as well (the Busway or Airport Light Rail from the Airport to Botany via Puhinui and Manukau is an example of a transit link doing both). If you would like a larger resolution of CFN 2.0 you can see it in the main document linked in this post. The South is a vital and growing part of our city; high quality public transport is integral to linking these large residential areas with employment and education centres throughout the region. The South will be host to large future housing growth in both existing sectors such as Otahuhu, Papakura, & Manukau, as well as new suburbs around Drury & Pukekohe. The two maps below show the South, on the left, are places such as Otahuhu, Wiri, Manukau, Papakura & Takinini, etc. while on the right are Drury & Pukekohe. It is vital the existing rail services through these areas are expanded to serve these new and expanded communities if they are to prosper. “5,300 hectares of land identified for urban development. This could result in 42,000 homes and 19,000 jobs over 30 years (note from admin: full yield is 55,000 homes and 35,000 jobs). The decision version of the Unitary Plan provides for greater capacity should this be required.”13 The South sadly also scores very high in the 2013 deprivation index and improved and affordable access to employment and education is an important tool in the fight against deprivation and inequality. The Eastern/Southern Rail Lines currently service the South, the CRL will improve journey times by removing the Western Line dead stop at Newmarket, as well as allowing a bypass of the slow Newmarket Branch Line, access to Up/Midtown will improve because of the CRL. The main objective for us was to maximise this asset & the building of the CRL, as well as a new RTN connecting the East, the South, and the Southwest/Airport areas. It should be noted that the Congestion Free Network 2.0 is about forming transit spines within a sub-region area or connecting different sub-region areas up. The CFN 2.0 does not show Frequent Transit Network routes such as the Great South Road 33 bus, and the 31 and 32 services in the Southern Auckland area. It also should be noted that Manukau, Otahuhu and later Botany form major transport interchanges where both Frequent Transit Network busses and local feeder busses connect up with the Rapid Transit Network spines mapped in the CFN 2.0. Currently Manukau serves as the nexus point for most if not all South Auckland busses that radiate from the soon to be completed bus station. Otahuhu is also a nexus point but at a smaller scale to Manukau. RTN CONNECTING THE EAST, THE SOUTH, AND THE SOUTHWEST/AIRPORT AREAS. An integral part of the strategy is a new Rapid Transit connection between Howick-Botany-Manukau-Airport/Airport Employment area. The likely passenger demand and available route suggest that Bus Rapid Transit is the most appropriate system for this route immediately, with the potential for an upgrade to Light Rail in the future once ridership grows. The route, however, would be future proofed fully for Light Rail, and if extra funding came available for Light Rail, or the need became apparent we would be completely open to Light Rail. The reason Light Rail is imperative on other lines is due to city centre bus capacity constraints, due to large volumes of buses due to converging routes; this route does not have this issue. Another reason is that it leaves space for a heavy rail corridor in the future if Transport Planners wish to connect any potential Intercity Rail to Auckland Airport, while this is outside the scope of the CFN 2.0, it has been mentioned, and we believe we should not prevent future governments from this choice. beyond scope. However the CFN is open to a diesel shuttle between Pukekohe & further south, or if the electrification is extended extending Southern services to these areas. The combination of these two major modes Network creates a North-South, as well as an East-West spine for the South. These routes supported by the complementary New Bus Network creates a reliable public transport network for the south, connecting jobs, homes, and community. The routes are focused on supporting proposed greenfield and brownfield development and aiding a region that reports higher levels of deprivation. While the CFN 2.0 misses the Manukau South Rail Link (giving direct services from Papakura and Pukekohe to Manukau without a transfer at what will become a very busy Puhinui Station when the Airport-Manukau Line is operating) the main three spines give both rapid transit connections within Auckland’s largest and fastest growing sub-region and between the South and the rest of Auckland. To me this is major win number one. Major win number two is how the CFN 2.0 marries up with the 31, 32 and the 33 Frequent Transit Network busses that ply Southern Auckland effectively and efficiently at several key points (Manukau, Papatoetoe and Otahuhu). Major win number three is the provision of the Airport-Puhinui-Manukau-Botany line that would start as a Bus Rapid Transit system, evolve to a Light Rail Transit system as demand grows and allow a heavy rail connection either within the area or slightly further north (Otahuhu) for possible inter-city travel to and from the airport. Finally major win number four is the Congestion Free Network 2.0 marrying up with the objects of Transform Manukau. 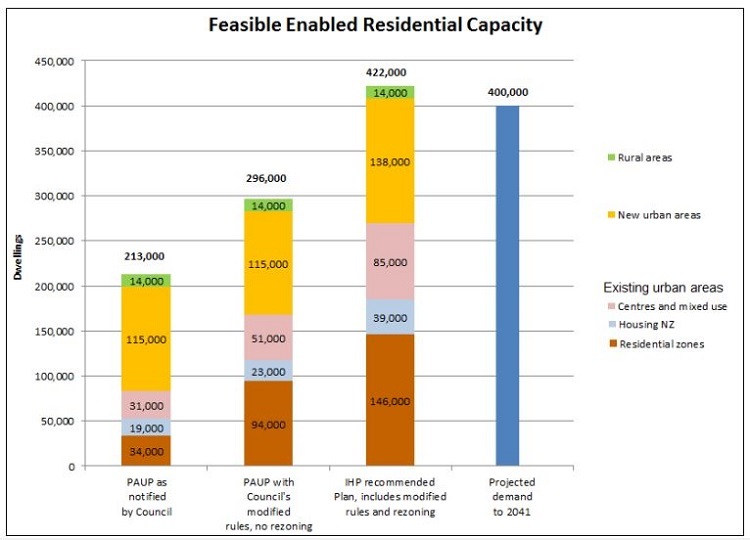 Panuku in Key Move Five (also see: #ourmanukau Key Move 5: Enhancing Community Connectivity. 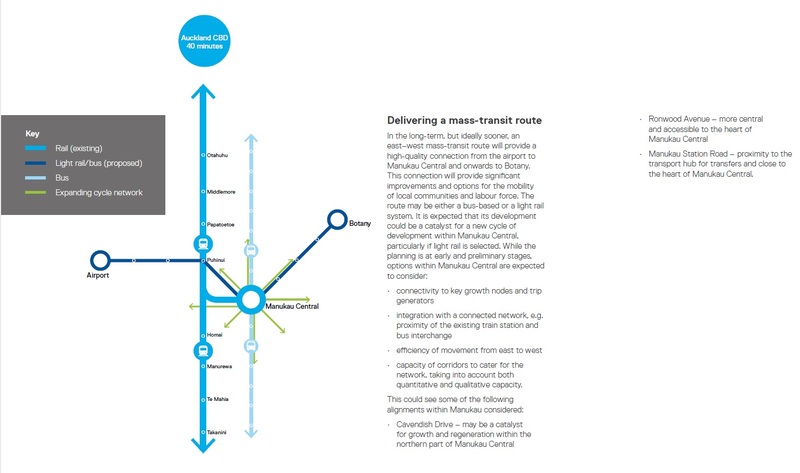 Part 23 of the #TransformManukau Series) outline how Manukau City Centre serves as the nexus point to transit in Southern Auckland much as how Britomart in the City Centre does with transit Auckland-wide. What the Congestion Free Network 2.0 has done is recognised Key Move Five but also added in a cross-town service from New Lynn to Onehunga, Otahuhu, Otara, Ormiston and Flatbush. 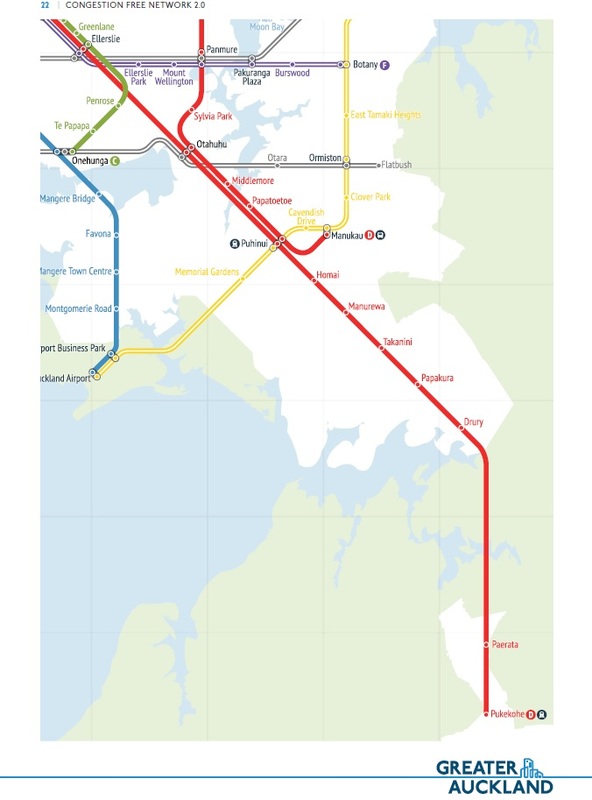 While this cross-town line does not connect with Manukau directly (as in you would transfer at Otahuhu) the CFN 2.0 does strengthen what Panuku have envisioned with Manukau and its positive consequences that will have to wider Southern Auckland. These projects would deliver large benefits for small cost within a quick period allowing us to leverage some of the gains of the CFN 2.0 swiftly as the more major projects go through the investigation/business case/NOR/building phases. The ones in bold I consider absolute priority one and need to be completed by 2020 at the earliest, 2023 or when the City Rail Link opens at the latest. Well done to the Greater Auckland team for assembling the Congestion Free Network 2.0 and equally well done with your recent fundraising drive achieving target as well. 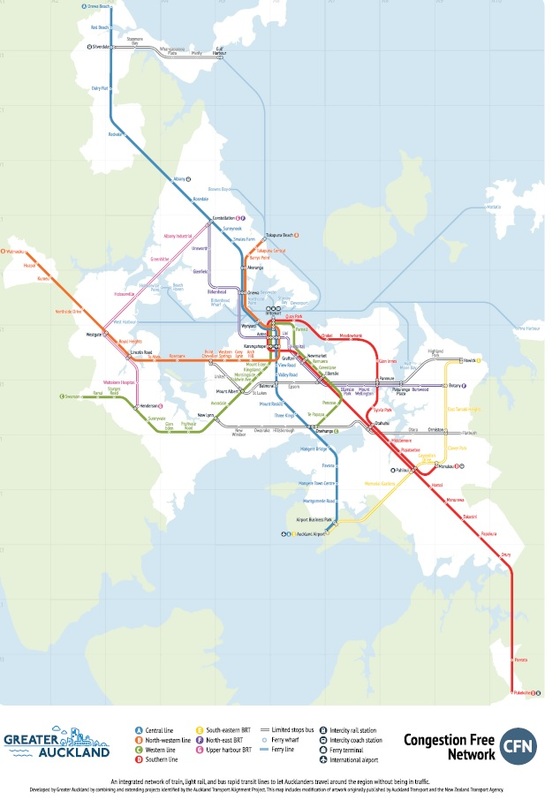 Congestion Free Network 2.0 will provide the next platform in advocating for a transport system that actually gets Auckland moving! Northern busway extension to Albany is underway as part of the SH1-WRR interchange project. Estimated construction start according to NZTA is 2018.